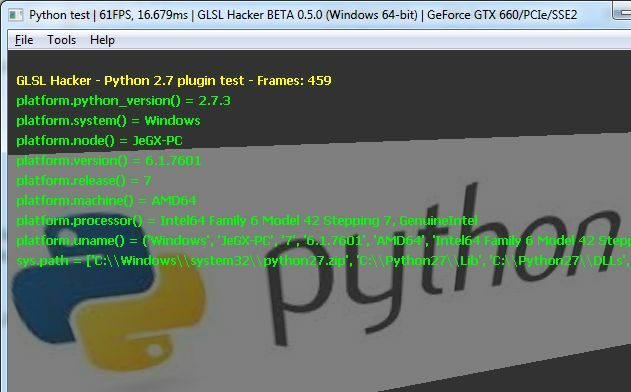 Python is one of the scripting languages supported by GLSL Hacker. Here is a quick introduction to the essential notions and syntax of Python programming language. All following notions are general and are not specific to GLSL Hacker. Thanks to this primer, you will be able to quickly tweak and hack GLSL Hacker demos. GLSL Hacker 0.5.0 is available with a Python 2.7 plugin. The reference manual of Python 2 can be found HERE. This primer does not cover advanced topics like object oriented programming. It follows the same line than Lua Primer fro the Impatient: providing a quick way to read and write basic Python programs or scripts. Python supports two kinds of comments: single line comments and multi-line comments. Variables in Python have a type but there is no type declaration. Common types are numbers (float, integer), strings, lists, tuples and dictionnaries. Variables defined in a function have local scope while Variables defined outside functions have global scope. Tuples use parentheses while lists use brackets. Tuples can’t be updated, their size can’t be changed while lists can be updated, elements can be added or removed. Dictionnaries is a kind of hash table and are made up of pairs of key:value. The key is usually a number or a string. app_name = "GLSL" + space + "Hacker"
Unlike C, PHP or Lua, Python does not have braces to delimit blocks of code like functions or tests. To delimit blocks of code, Python uses indentation and indentation is severely inspected by Python, The smallest difference in indentation leads to fatal compilation error! So be careful with indentation and use a correct text editor to handle indentation properly. Functions in Python can take multiple arguments and can return multiple results. Fans of Python use the phrase batteries included to describe the standard library, which covers everything from asynchronous processing to zip files. The language itself is a flexible powerhouse that can handle practically any problem domain. Build your own web server in three lines of code. Build flexible data-driven code using Python’s powerful and dynamic introspection capabilities and advanced language features such as meta-classes, duck typing and decorators. # possible values for y: 2, 3, 4 and 5.